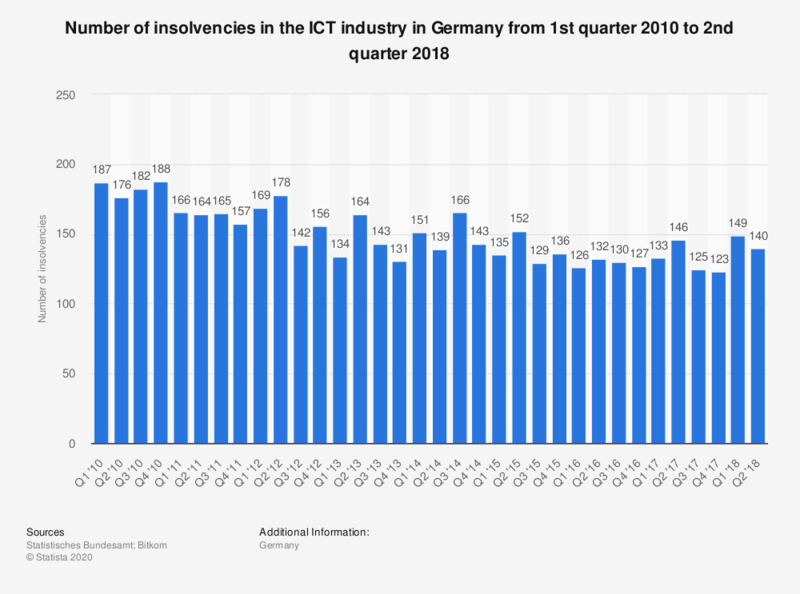 The statistic shows the number of insolvencies in the information and communications technology industry (incl. consumer electronics) in Germany from the first quarter of 2010 to the second quarter of 2018. In the second quarter of 2018, 140 companies filed for insolvency. According to the source, the data refers to the following areas: DV hardware and peripheral devices (WZ 26.2), information technology devices and installations (WZ 26.3), consumer electronics (WZ 26.4), telecommunications services: landline, mobile communications, satellite signals, other (WZ 61), software & IT services (WZ 58.2, 62,63.1, 95.1).